FORMER EUROPEAN AFFAIRS Minister Lucinda Creighton gave a wide-ranging interview to Marian Finucane on RTÉ Radio this morning in which she insisted cannot be stopped from running for Fine Gael again at the next election. Though the Dublin South East TD faces an uphill task when the next general election is held she insisted this morning that if the members of her constituency choose her as the Fine Gael candidate she cannot be stopped from representing them. “I don’t think I can be stopped if that’s what the members of my constituency choose,” she said. “Now I wouldn’t second guess or try to pre-determine the outcome of a convention because the members in Dublin South East will decide that. Creighton said there was a “strong likelihood” that members of Fine Gael who have lost the whip after voting against the Protection of Life during Pregnancy Bill could be allowed back into the party before the next election. I don’t spend much time in it. I go in there for my lunch and for coffee in the afternoon. I’d rarely be in there at night. I don’t think it’s neccessarily a bad thing but if it’s abused obviously it’s a bad thing. It has long been a bug bear of mine… it needs to change, very simply. I told him last Monday that I felt the way things were going it was unlikely that I would be able to vote for the legislation. “Loads of my friends are gay, I don’t see myself in any sense as being opposed to gay rights, but I did express a view before the election - which by the way was also expressed by the party but then they changed their mind – that we didn’t support gay marriage which is, I suppose for some, the ultimate destination, but not for everybody. Paul’s view would be that I am a big enough girl to make up my own mind and I appreciate that. I think that’s an important basis for our relationship. … I think Finance is the one that everybody aspires to, who’s serious in politics, because that’s where the real decisions are taken and I think it’s a fascinating portfolio. Poll: Should Fine Gael allow rebel TDs to run in the next election? Email “"I'm not opposed to gay rights" and 9 other quotes from Lucinda Creighton”. 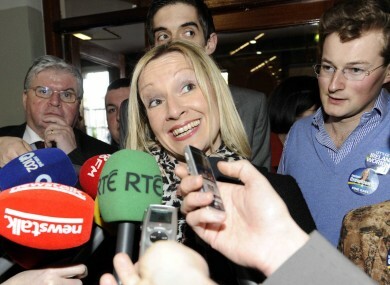 Feedback on “"I'm not opposed to gay rights" and 9 other quotes from Lucinda Creighton”.